For the first town featuring in our top spots for breakfast on the Outer Banks, we decided to feature the quaint town of Manteo, North Carolina. Located just off the beaten path of U.S. 158, Manteo has a plethora of lovely shops, art galleries, historic landmarks and of course, restaurants. 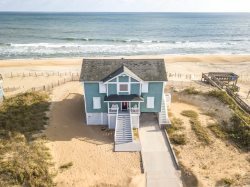 Our OBX Eats series normally highlights just one Outer Banksrestaurant that we recommend checking out however for this series, we're going to give you a top list of the spots you have to try for breakfast in thegiven town. Weather you're an Outer Banks native or just visiting for the week, you won't be disappointed if you have breakfast at one of the spots listed below. Let us know in the comment section if you've been to any of these spots for breakfast and what you think! Serving up delicious family-style seafood since 1960, Roanoke Island local's known that Darrell's prepares seafood right. Breakfast is served until 11 a.m.every day except for Sunday - most places in Manteo are closed on Sundays. Their breakfast menu includes all of the usual favorites - eggs, bacon, home fries, and hot cakes, all priced very reasonably. What sets them apart frommost breakfast spots on the Outer Banks is their Crabmeat Omelet that's served with a hearty portion of fresh crab meat - not imitation, along with theirPecan and Sweet Potato Pancakes... YUM! A true Roanoke Island local's favorite, TL's Country Kitchen is an unpretentious, bare bones spot to get a great meal and an even greater price. The décoris reminiscent of a throwback classic era of local dining establishments. They're packed on Sunday mornings proceeding church service and not because they're one of the few places in Manteo that's open on Sunday (although theyare), but because TL's breakfast features all of the breakfast staples you'd expect prepared just the way you'd expect. The perfect spot to stop in for a sit down breakfast and enjoy a nice cup of coffee and hearty morning meal at a fantastic price. A great place to check out while walking around downtown Manteo, The Coffeehouse on Roanoke Island may not have the most interesting name, but theirhot/cold drinks and delicious pastries make up for the fact. Perfect spot to grab a quick specialty coffee - they have tons of options that you'd see at a chain coffee shop. Located right on the stunning Manteo Waterfront, Poor Richards is at the top of many Roanoke Island natives list of favorite restaurants. Serving up someof the absolute best breakfast dishes items you can image, Poor Richards only uses the finest meats and cheeses available - Boar's Head. Their breakfast menu features all of the staples - eggs, toast, bacon, pancakes, waffles, sausage, but it's all prepared flawlessly. Poor Richards isn't afancy restaurant, it's just good food, superior service in a friendly, non-pretentious atmosphere. If you're visiting Manteo during the warm spring, fall or summer months, you can enjoy your breakfast outdoors on the waterfront. They have 5 or 6 tablesthat are on the outdoor deck and literally steps away from the Roanoke Sound. That's it for Manteo! Weather you're a local or visitor, these four spots should keep you plenty full and satisfied for breakfast next time you're on Roanoke Island. Stay tuned for future posts where we tackle breakfast time for Nags Head, Kill Devil Hills, Kitty Hawk, Duck and Corolla. Remember to eat local... Always!